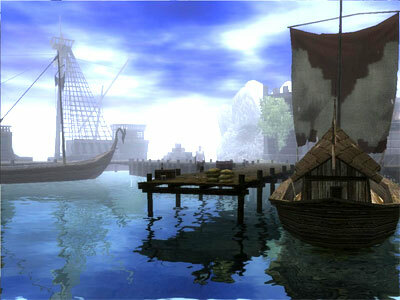 The Harbor of Phlan is far from being a major stop in the Moonsea sea lanes, but it is still a very busy trading hub. Despite its smaller size compared to other harbors it is by far the best-protected, with a clear and safe approach for incoming vessels. It is thus often used as a refuge for ships in the frequent and treacherous storms that often gather in the Moonsea. It is the main point of entry for goods and people into the city, and as such it has been thoroughly reconstructed to the point it hardly bears the marks of the repeated invasions of the city. A heavily fortified wall separates the docks from the Harbor district, and the only gate through is well manned by watchmen from the nearby Porthouse. 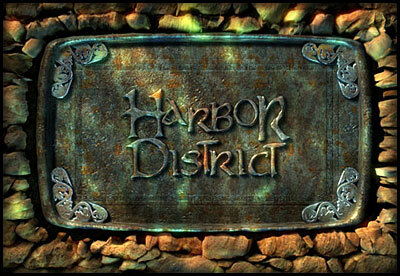 The Harbor district fashions a bustling marketplace where all kinds of goods are purchased and exchanged. A large section is covered by warehouses where cargoes are constantly being unloaded, stored and moved about. As with any harbor, the immediate area around the docks is generally populated with lower class citizens, dockworkers and stranded sailors waiting to get on a ship. Generally speaking, the warehouse area is filled with all kinds of scum and those who have no business in there do better staying away. The Harbor's Docks at night are not recommended for anyone, as fights among drunken sailors and muggings are common, and the Watch usually stays out of the streets except for the occasional patrol. The Northern end of the Harbor District right by the Harbor wall is where several governmental institutions, temples and noble estates are located.Studded with all kinds of landmarks, it hosts the City Hall, site of the Phlan Council; the Justice Hall, headquarters of the militia; and the Mayor's house. It also contains a number of temples, prominent among them the dome of the Waiting, the magnificent temple of Tyr. 1. The Sword and Serpent. A rickety shambles of a tavern above, housing a cavern-basement tavern and … calling it a brothel is too charitable… containing the scum of Phlan, tolerated mostly because half its clientele are out on ship at any moment and hard to prosecute, and because it tends to encourage birds of a feather to flock together here, rather than near respectable people. 2. The Holy Fortress. This temple of Tempus has seen more or less everything the Moonsea could throw at it, and its zealots are to be found in all the big fights.The public is permitted to use the training grounds below so long as they adhere to strict Tempuran regulation while bouting. Prize fights and gambling on the same are strictly forbidden on the training grounds, to the perennial disappointment of newcomers to town. 3. The Waiting. Ancient Phlan was a stronghold of The Triad in the northern Moonsea, and those who worship here would like to keep it that way.Officially a temple to Tyr, adherents of Torm and Ilmater are welcome inside and treated as brethren-in-faith even though Tormites and Ilmaterites have their own (much smaller) missions in town. 4. The City Hall. Inveterate Gossip Malvolio Tuck is the first to greet (and comment on, later) everybody who comes through the front door. The building also includes a rarity, a library which can be used by the public.Its selection is quite limited, but open libraries are a rarity, and it’s leaned on regularly by all manner of researcher. Adventurers should note that Tuck oversees the selling of bounty licenses. 5. The Water Lily. Not exactly the movers and shakers of the Moonsea, Sunites have nonetheless kept their ancient toe-hold in Phlan, largely by organizing the best parties and catering to those who need either artwork or a skilled match-maker. 6. Watch Headquarters/Justice House: Where you go if you do something stupid and they have to throw you in the cells to await hanging, a fine, or a sternly-worded request that you not make them up the ante on you next time. Adventurers often wind up in trouble here, because while they tend to mean well, by and large, they also tend to make messes that the miserably-paid Watch then has to clean up.